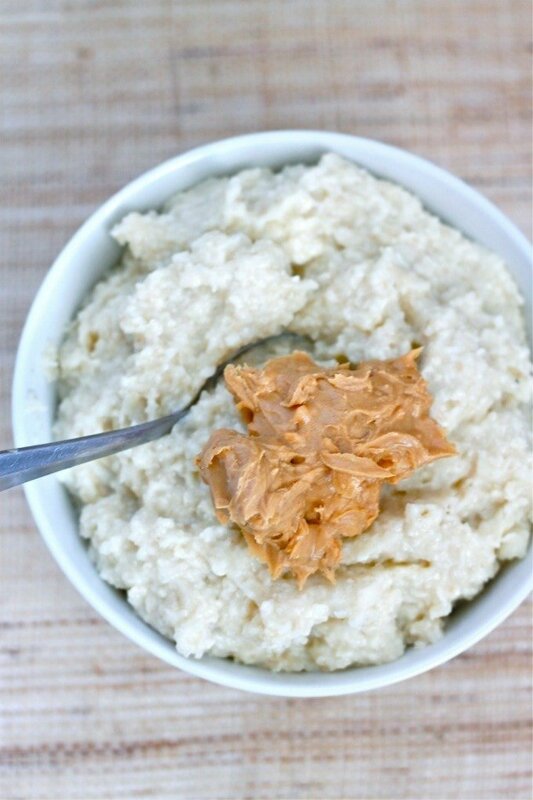 The taste and texture of a classic cake batter but in a healthy breakfast oatmeal form! This Cake Batter Oatmeal is gluten free, dairy free, sugar free and has a vegan option- Perfect to be eaten hot OR cold! I’ve been on abit of a bender coming up with combinations to post when it comes to pancakes or waffles. I like to think outside the box or use my favourite store bought things as inspiration. The other day, I wanted to try and recreate an amazing Baklava into a Baklava oatmeal. That idea was shot down by the maven herself, Davida. I drowned my sorrows in my newest obsession- Cake batter. Scrap that-Cake Batter Oatmeal Pudding– which is healthy and filling and the ideal start to your morning….or to heal your wounds. 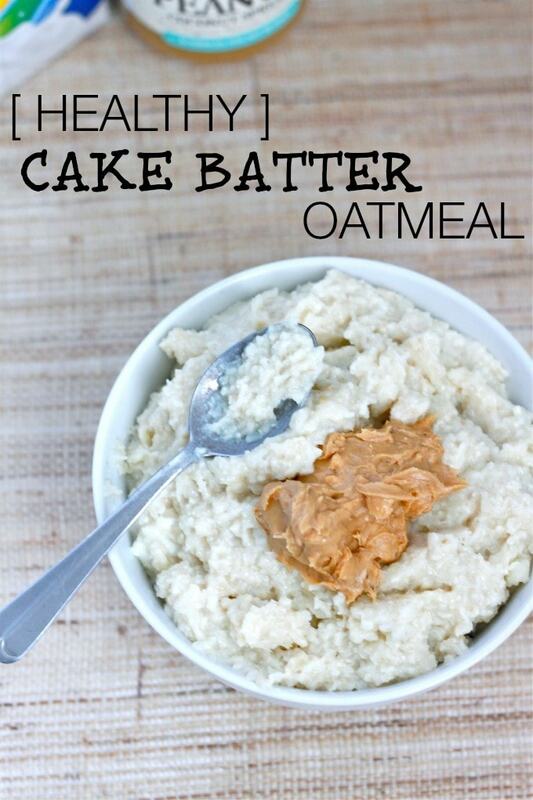 So how does this Oatmeal Pudding taste like cake batter? Well. Hear me out. I used oat bran as it lends to a creamier texture than classic rolled oats do. A vanilla protein powder lends a protein boost, with the flavour of a cake batter base. The key ingredients, however, are the whole egg and the coconut flour. Adding a whole egg and the coconut flour in the cooking process allows for a dense, cake texture. Ensure you add the extra milk as the coconut flour absorbs liquid better than a sponge. Next time someone shoots down your ideas- Build a bridge, get over it, and eat cake batter…oatmeal pudding. A breakfast bowl which tastes exactly like a classic cake batter but without the nasties- fuel your morning with this healthy dish. Combine oat bran, salt and 1 cup of milk in a saucepan or microwave safe bowl until most of the liquid is absorbed. Whisk in the whole egg very well and continue cooking for another 1-2 minutes, or until the egg is fully cooked and oats are fluffy. Stir in the vanilla protein powder, sweetener of choice, vanilla essence and coconut flour until fully combined- Oat bran mixture should be extremely thick. Add in the extra 1/4 cup of milk and ensure it is well mixed. Once this is done, refrigerate uncovered. 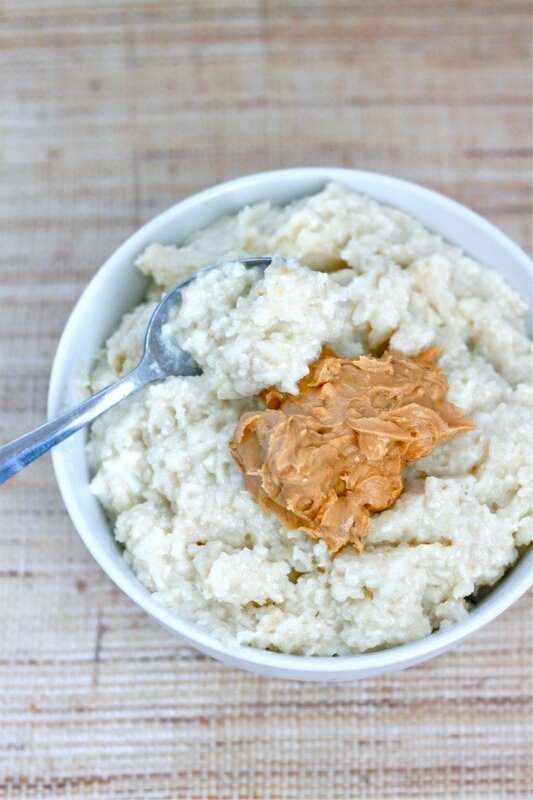 The next morning, stir the oatmeal very well before adding the shredded coconut and nut butter/toppings of choice. The protein powder is optional- If you omit or used an unsweetened one, ensure you add some honey/maple syrup/brown sugar/sweetener of choice. Ensure you use the whole egg and not egg whites as it provides the cake batter like texture. If you don't have coconut flour, add a tablespoon of flaxmeal, oat flour or an extra tablespoon of shredded coconut. Have a great weekend folks- Hope to see you join in some Spill it, Sunday action! Have you eaten oat bran before? What do you think of baklava oatmeal? How do you drown your sorrows? I’ve never tried oat bran, but this sounds delicioussss. Can you get coconut flour at woolies? You can at some of the bigger ones! I know Coles does stock Bob Red Mills. What perfect timing! I have just about embarked on a love affair with oat bran (thank you Miss P! )..so I will be doing a take on this I’m sure 🙂 . Oooh baklava oatmeal? If it has that surupy sweet thing going I think I’d be all over it; I need to check that out. I would give ANYTHING to be that SPOON! Can I be the BIG SPOON? lol!!! Sounds absolutely delicious! I need to stock up on protein powder and then I need to eat this this weekend before the Whole30 starts!!! Baklava isn’t for me. Way too sweet. So I guess I would pass on the baklava oatmeal. Especially when some cake batter oatmeal pudding waits! I never had oatbran but now I am intrigued to try it! Chocolate always helps me to drown my sorrows. You need to try with oatbran- It is such a creamier texture which works so well with this specific recipe! You had me at cake! Love oat bran and usually go for a half oat bran, half oat mix when cooking oatmeal on the stove! I’ve never been huge on baklava but I do think the flavours full work rather well in oatmeal…only one way to tell! As for drowning my sorrows, pass over the ice cream pleeeease :-)! I love using the mix of both too, but I had to accommodate it to taste the flavour! Oh ice cream….it can do no wrong! Oh hello cake batter porridge – that sounds delicious! Please make a baklava – i LOVE baklava. They have a little baklava shop near my sister’s house and it is insane! When I was having oatmeal regularly I always whisked in a whole egg, especially for protein and texture reasons. And also always a tbsp of ground flax seeds for fiber! Those were the basic ingredients in my oatmeals everyday. So good! That sounds delicious- why did I leave my flax in Melbourne! Yummy! And major love for using the WHOLE egg! Mmmm, cake batter anything sound good, but even better for breakfast! I think you can guess how I drown my sorrows…. I haven’t had oat bran before! But now I do want some cake batter… I drown my sorrows in cookies and ice cream. Or on a really bad day, both in the form of a cookie ice cream sandwich! Cookie ice cream sandwich….guess who had one last weekend. So Good. SOOOO good. I drown my sorrows in chocolate or ice cream, but oatmeal works too 😉 I’ve never been the biggest fan of adding protein powder to oats because I found that it made them strangely watery and soupy, but I’ve never tried pairing it with coconut flour. Gonna have to put that on the to-do list, because uhm… who doesn’t like cake batter?!?!? Especially first thing in the morning. It definitely depends on the protein powder? It’s…okay I need to vocalise it to you because there’s an entire science behind it. If I’m really upset, I actually lose my appetite. It’s very strange. I’m so upset you have a room mate now. It started with a lost iphone and now this. Fail. I am making this tomorrow for lunch! And please make a baklava version. My mom would love it. I drown my sorrows in ice cream or froyo with tons of oreo crumbles! I love that- it’s totally a lunch recipe. I will make a baklava version. One day. Ok, I love that there’s an egg in there AND I love even more that there’s coconut flour in there. Why is it so magical?! It’s because it was made with my hands. MINE. oatbran makes the best porridge!! i love it! reminds me of rice pudding, almost. But way thicker! Yum! I love oatmeal and cake batter. I will be making this for breakfast this weekend. i haven’t gotten on board the oat bran train yet…but it sounds like that must change. sounds amazing. Thanks, Linds. It’s pretty epic texture wise! I’ll make it in person when I visit you 😉 Deal? Deal. I love oatbran! I haven’t had rolled oats in a long time but oatbran is my go to, there is just something about that texture. I have made it with coconut flour and egg whites before but I haven’t tried it with a whole egg. I must do it soon because the photos look like the texture turned out perfectly. Thank you, Sarah- definitely try it with a whole egg- it takes the texture to an entire new level! Oh yes, you totally had me at cake batter! I mean…cake batter anything, has my name written all over it! I’ve never tried oat bran before, so I obviously, don’t have any at home, so I think I’d go with rolled oats here. It looks delicious! OOOO if you can get oat bran try it with that- it MAKES the texture! I don’t think i’ve ever actually had oat bran! But if it leads to cake batter flavoured oats….must try. I would say that I drown my sorrows in chocolate or ice cream. Basically, I am a stereotypical female. Haha, not burgers and pizza? who are you? Ah I wish I had these in the winter! I’ll just have to pin them for next November 🙂 Do you ever eat oats for other meals of the day? I haven’t recently, but I have before! So I think I know what breakfast is going to be tomorrow thanks to you! Hahaha well now I can gift them to you. NO JOKE P YOU’RE DOPPELGANGER IS ON THE VOICE AUSTRALIA. Okay, she’s not a contestant but the wife of a contestant that just got married in Sri Lanka. 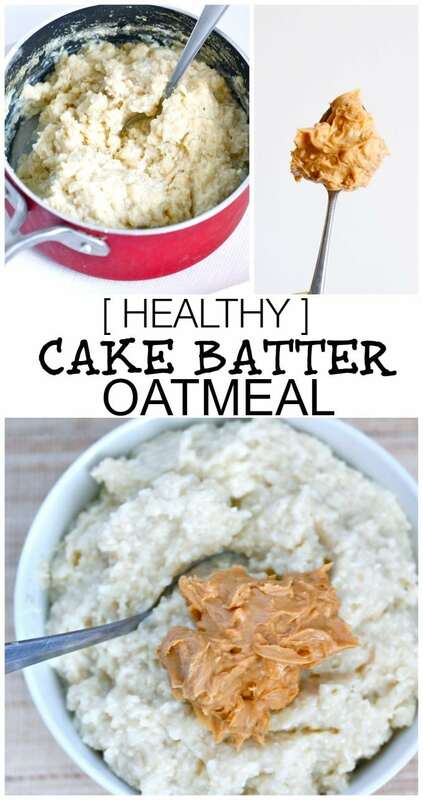 Oh my, cake batter oatmeal sounds really great and it’s healthy too?! Thanks for the wonderful recipe, I’m definitely going to try it! Wow… This makes my current bowl of oatmeal look sad…. I think I need to spruce up my breakfast! I’m just so hungry in the morning that I want breakfast ready right away! I’m gonna have to invest some time in doing overnight oats. YES! that is the beauty of this method- making it the night before- it MAKES the texture! Ahhh I cannot do oatmeal–I’m totally the minority with this I KNOW but it’s the texture. Overnight oats are ok because I make sure they are cold and not too liquidy. BUT I swear–I swear–If i liked oats I’d make these tomorrow for breakfast. Perhaps I could omit a few of the ingredients and overnight them? Ehhhhh??! I was like that aswell because I DESPISE soupy gross oatmeal hence….this pudding style! Promise it isn’t like it. I think I am with Davida on the baklava oatmeal. I can’t even imagine that. I’m with Erin on the oatmeal texture thing. I can do oatmeal ONLY if they have like zero liquid in them. Mushy things just don’t work for me. I think that’s why I don’t like bananas. Anyway, these actually look like a good consistency because they aren’t too soupy! So well done, sir! Making oatmeal look good to me is indeed an accomplishment! YES- this is why I made the ‘oatmeal pudding’ style- I refuse it to be liquid like or watery…that’s not oatmeal. That is gruel. This looks absolutely amazing. Definitely saving for future kitchen attempt! That is interesting maybe I will have to try it. Though to be 100% honest only red velvet cake heals my wounds completely LOL. Hahaha. Maybe I should try a red velvet cake oatmeal pudding. Pinning now to make for my kids. I think they will love it!! I want the Baklava Oatmeal. This looks so tasty!!! Pass the pudding please 🙂 Thanks for linking up to this recipe on #RECIPEFRIDAY! It’s so good- especially for breakfast…or lunch. or dinner. Since I love Cake Batter anything I’m sure I would love this! Looks great. You are like an evil genius with all of these concoctions. Your passion for food always comes through in your recipes. Thank you, my friend. I’ll make a Tara oatmeal chock full of olives and granola. Never heard of oatmeal pudding! This recipe sounds fabulous… and I’m not normally a fan of cake batter flavored things! I usually drown my sorrows in ice cream. And my excitements. And my…anythings. HA! Thanks Alysia- it’s the process which gives it that texture! Ooo intriguing, indeed! I kinda want to sleep on this oatmeal pudding. It looks so fluffy! I say yay to baklava oatmeal. Davida, how could you say no?! Davs is just a human mole. It is fluffy. Fluffy like a chicken before it’s made into chicken feet. You’re going to hate me but I just can’t do oatmeal. I think it’s a texture thing for me BUT I can do chinese porridge which is kind of the same texture. Have you had jook before? YES- I have! I love congee with prawn too and this texture is similar- I hate the gross soupy like ones. You did it again! I just ate this (at 4pm this time haha). It really was like cake batter! I followed the directions exactly and it was amazing! Nice work! Wait, I lied. I added sprinkles! Adding sprinkles is genius….you get more pudding! Thanks Megan- it is delicious! Geez. I have to whipe my keyboard, it’s covered with drool. This is SO my taste!! I LOVE coconut flour with oats or oatbran – and the thicker the better, we know that by now. Ok, so it’s easy, I will just move in with you in your shoebox when I get there. We will have a pudding party. Come over…bring a spoon…for me. I love baklava. It’s one of my favorite desserts; all those nuts and honey combined with flaky pastry. I think you need to make that happen. To hell with Davida. Alright fine, it might be hard in oatmeal, but if anyone could make it work, it’d be you. OMG this looks SOOOOOOO amazing!!!!!!!!! You are an oatmeal genius! I really love eating oatmeal for breakfast, it is one of the few breakfast items that actually keeps me full for the whole morning! Yes yes YES!!! Love the addition of the whole egg…the custard like taste it lends to oats is unbelievable! And I’ve always thought adding a bit of protein powder and coconut flour to oats gave it a little cake batter feel! Love it! You are the one who also enjoyed the whole egg! Thoughts on red velvet oatmeal pudding? Just pinned this! I think I’ve found my Saturday breakfast!!! WE’RE HAVING THE SAME SATURDAY BREAKFAST. If only we could skype simultaneously. wait. you made LAMINGTON PANCAKES?!??! I *knew* you were my new favorite blogger. I’ma gonna need to make those. and oatmeal. any kind of oatmeal and I am THERE. this sounds fantastic! Oh wow, you know Lamingtons?? That makes me so happy! Very nice. Sounds so delicious! Did someone say cake? Love it! 🙂 Glad you enjoyed it!